Cake! According to Model_Gal, this cake was designed by Elisa Nicole Strauss owner of Confetti Cakes and her team (she been on the Food Network several times for cake challenges). 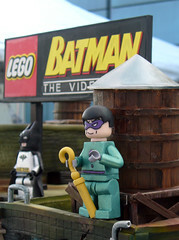 The cake designed for the LEGO Batman: The Video Game launch party in New York City. These cakes are awesome! Elisa blogged about the cake here, she also includes a photo of how the overall cake looked.